IKOMicro Precision Positioning Table TM is an extremely compact precision positioning table comprising IKOMicro Linear Way L of a track rail width of 2 mm, which has a reputation in a micro device field and a precision-ground ball screw of 2 mm in diameter. For the components of IKOMicro Precision Positioning Table TM such as Micro Linear Way L and ball screw, stainless steel is used so that the product has excellent corrosion resistance. Optimal for not only miniaturizing and compactizing various machines but also for highly accurate positioning table usage requiring even higher accuracy where existing small positioning tables were not sufficient. Ground ball screw drive realizes ultra-small size with sectional height of 20 mm and width of 17 mm. The IKOMicro Linear Way L with track rail width of 2mm is adopted in the table guiding parts, and miniature ball screw with screw diameter of 2mm is used in the feeding mechanism. The screw lead can be selected from 0.5 mm, 1.0 mm and 1.5 mm. Unparalleled low cross sectional height in the ground ball screw drive as well as smooth and stable sliding and running accuracy and highly accurate positioning with excellent following capability and little backlash are achieved. Select from two slide table shapes: standard table and long table. As two Micro Linear Way L units with two slide units are incorporated in parallel into the long table, the table is structurally resistant to moment and complex load. AC servomotor and stepper motor can be selected. 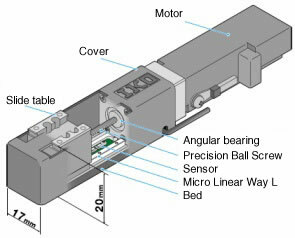 Because both AC servomotor and stepper motor are available, they can be selected according to usages. Super-miniature sensor can also be optionally built in. Respective built-in sensors (origin, pre-origin, CW, and CCW) can be designed without changing outside dimension. Some products are not shown in the catalogue. Also, modifications can be made to meet your requirements. Please do not hesitate to make inquiries.